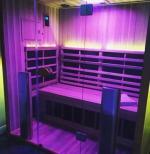 Infrared sauna does wonders for eliminating toxins in the body. I am 61 years of age. Have been using this sauna which is set up in the gym I frequently go to. No you do not loose weight by using the sauna. After a work out of about 1 hour, I use the sauna for 30 minutes. I also maintain a fairly decent diet but not restricting myself to my cravings. Most importantly I have a better skin and I have a clean bill of health. Losing weight is hard work but being positive and persistent in exercise and diet will see excellent results. Infrared sauna is the best thing I look forward to going to the gym because it relaxes me after a good work out. I have been using this for a year now every 3-4 days a week.